“There are few things more uniquely American than playing a recreational sport in the shadow of the Washington Monument or the National Capitol Building. Unfortunately, the National Park Service (NPS) has proposed a ban on all sporting and recreational activity along the National Mall from 3rd to 17th Streets. 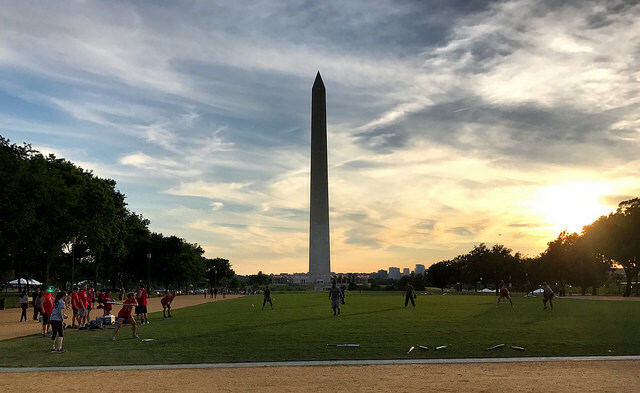 The ban includes eliminating currently permitted softball fields around the Washington Monument grounds and the first-come, first-served policy on the plots from 3rd-14th Streets. The proposed policy is an extreme position and massive change from long standing practice. Among the NPS-cited concerns, their primary reason offered thus far for the total ban is the perceived impact sports and recreation might have on the recently installed grass turf. The total ban is antithetical to the purpose of the Mall. Through the inception of the National Mall dating back to the L’Enfant plan of 1791 and the redesign by the McMillan Commission of 1901, a main intention of the Mall is to serve area citizens and the city by providing open recreation space. The National Mall represents the vast majority of open grass space in the city and is often cited as a contributing factor to the city’s frequent ranking as a best place to live or fittest communities. The NPS over the past 2 years has already successfully managed preservation of the newly installed turf along the Mall by resting sections when necessary and working with local stakeholders. At its peak recreational sports typically use portions of the Mall merely 4 workdays a week during a 3-4-hour early evening time frame and light use of some weekends. This small time frame represents, at most, a moderate use of the Mall but has an over-sized impact on creating a foundation of well being for the city. Even those who do not regularly participate in the games, tourist and local residents alike, will often stop to watch the activity and reflect positively on the games and at times, join in themselves. The NPS ban would dampen the vibrancy of the City by directly restricting access of tens of thousands of area residents and touching a much larger number of people through its negative impact on health and wellness and the local economy. Exacerbated by an existing shortage of available play space throughout the city, the NPS ban would further stress the existing limited resources of the city and restrict groups like Congressional Softball, Senate Softball, House Softball, Flag Football, Soccer, Rugby, Ultimate Frisbee, Bocce, Kickball and others that have become a DC institution and part of the fabric of the city. While maintenance of the turf is certainly a worthy priority we do not believe it should be put above the recreational, health and economic needs and interests of area citizens. This uniquely Washington DC, and indeed American, Institution must preserved. Access to 3rd to 17th streets should remain open for sports and recreation as it is vital to the vibrancy and health of the city. We seek a dialogue with the National Park Service and other stakeholders to solve this impasse of access to the open space between 3rd-17th Streets. We are ready to collaborate with the NPS to establish best practices that balance the need for recreation and the integrity of the Mall turf. Please help us maintain access and recreation on the National Mall by signing this petition and spreading the word.